The blog is a solution of Udacity DL Assignment 4, using a CNN to classify notMNIST images. Visit here to get a full version of my codes. Looks more complex than MNIST. However, in this case, the LeNet-like ConvNN could achieve 91.6% accuracy (my best trial). In the dataset, 10 classes from letter A to J are included. You will find notMNIST_large and notMNIST_small two compressed files. 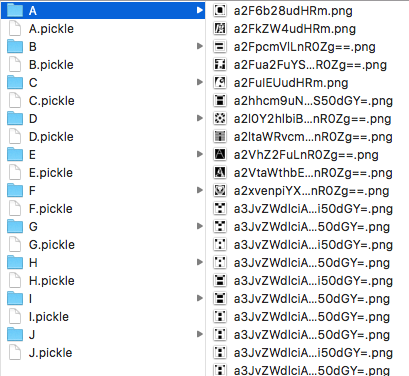 The normalized images are with the size of 28 * 28. Click here for getting dataset and .packle file. (You need to run it first) The data are downloaded and packed up automatically. As inputs of ConvNet, we need a cube for each image: width*height*channel. Usually for the RGB images, channel number is 3. But here we have only gray scale pngs, so the number is 1. We still need to reshape them, and also the labels. In the code, we have two convolutional layers, two pooling layers after each, then following by another Conv-layer, and a fully connected hidden layer. For optimization, dropout is used in the middle of Conv1 and Pool1 layer. 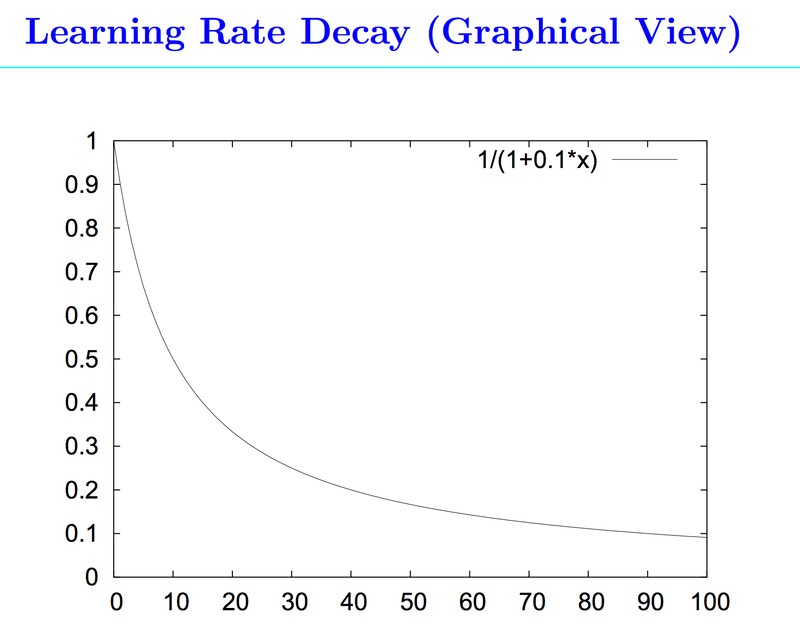 Also the learning rate decay is added. Before we start the ConvNet, a smart way is to define the spaces for the trainable parameters, mainly the weights and biases. In TF, Placeholder is used to declare a space for a tensor. You could give it a size and a datatype. The shape is a 4-D Tensor, with the data type being float. That is to initialize the tensor with empty space. We use tf.Variables() to initialize weights and biases. For weights, random values are normal, we can get them from a truncated normal distribution. In terms of biases, assign them to 0.0 or 1.0. The padding method, we use “Same”. the tensor [1,1,1,1] is the stride. strides is for each batch (sample), strides is for each channel or depth, stride  and stride  are vertical or horizontal move step. With the combination, the output “image” size is exact the same size with the input, 28 * 28. But the depth is different, from 1 to 16. Then we add a bias tensor. We have 16 channels on the first Conv layer, each layer we have a bias. So we have a 1-D tensor of 16 scalars. “The difference is on the way of dealing with borders. Same padding allows the sliding window moves to the border, with the exceeded pixels being all 0. But valid padding stops the sliding window when it reaches to the border, which will make the Conv size smaller than the input, normally. To prevent overfitting and optimize the performance, we simply add a dropout after Conv1 layer. Keep_prob is a scalar-tensor, the probability that each element is kept. In dropout, there is a probability of keeping the connection or not. In our experiments, we use 1.0 as the keep_prob, to make sure them to be unchanged. Pooling could be treated as a feature extraction. We have a 1*1 Convention before, then we have more deeper channels. Now let’s extract features from them. We use max pooling here, the sliding window is 2 * 2, which means we choose the max value from 4 values each time as the feature of the small patch. Same padding but stride is 2 * 2, so finally we will have a half sized image, 14 * 14, same depth (16). Tf.nn.lrn is short of tf.nn.local_response_normalization(). LRN normalizes the output before it sent into the non-linearity, which helps to bring inputs to ReLU to a common scale. Note that the same depth number will be kept if you do pooling only. Then there is another Conv layer, nothing magic here, keep the same shape. In the hidden layer we will add ReLU, the results is a huge matrix, logits. Hidden layer has 64 neurons. Afther the logits are got, compute the loss. We get a mean of the softmax (sigmoid) entropy. The cost function we chose is called cross entropy. Logits is the resulst value the model gets, tf_train_lables is the true result. In practice, learning rate drops through training. We prefer to have a smaller learning rate to achieve a better model. If something went wrong in your code, try to make the learning rate to be smaller. How to select the learning rate? TF has very nice functions defined. When training and validating, the keep_prob ( of the dropout) was 0.5, when testing, we use 1.0. Investigating the influences currently. How do you improve the CNN model? You could use dropout on each layer, add more Conv layers, achieve learning rate decay, etc. Once thing that you should think about is how to choose good hyper-parameters. When it comes to ConvNN, you might think about patch size. There is another way called Inception (I think it is proposed by GoogLeNet). Facing with a Conv layer, you could try pooling, or you could use different patch sizes (1*1, 3*3, 5*5). Instead of trying one by one, let’s use them together, probably assigning different weights. Make them all together as a very deep (because of more channels) new layer. How do we choose hyper-params to make models better?? All the data scientists are facing the same problem. Thanks for the blog. Did you really get Test accuracy: 91.6% ? Oh yes, I did. Nothing magic, just keep trying with hyper parameters! hey thanks for sharing your work! could you explain me why do you use dropout prob 1 for training et 0.5 for testing? Hey, sorry that was a mistake:) Thanks for letting me know!